Send Me The Mini DeepHeat™ for Maximum Pain Relief! YES! 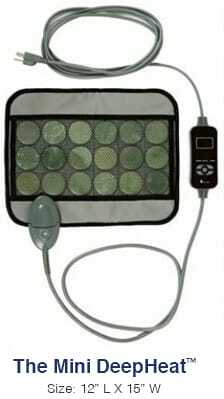 I want to experience 20 times more heat and healing than traditional heating pads. I understand far infrared rays from DeepHeat™ penetrate up to 2 inches below the surface of my skin, whereas traditional heating pads warm just the top 1/10th of my inch of my skin. Send me the space saving Small model. . All DeepHeat™ pads are 110V and 250V compatible (so I can use them at home or abroad)... do not emit ‘harmful’ and ‘electromagnetic’ fields... and can also be thrown in the freezer and used as a cool wrap. Stays Snug While You Move - The included, 4 inch wide velcro straps can snugly attach the mini to your arm, leg, shoulder, or lower back(staying firmly in the place to sore joints). Heating stones hold for hours so you don't have to stay "plugged into" a wall outlet (great for those on the go).